On the teaching faculty, we have well qualified experienced and devoted staff. Their professional commitment, supervision, involvement & guidance has been pivotal in the success of the school over two decades. Orientation & regular training programmes are organised for the staff from time to time to update their knowledge and teaching skills. The Administrative staff provides a strong support for the smooth functioning of the school. Mrs. Anjali Razdan M.Sc is Postgraduate in Botany from Bombay University and hold a P.G. Diploma in Higher Education (D.H.Ed.) and also a B.Ed degree. 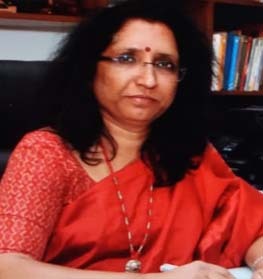 With a rich experience of over 36 years, Mrs.Anjali Razdan has conducted several workshops and seminars in teaching pedagogy and is a teacher trainer and mentor for in-service staff training. The one unchanging characteristic of contemporary education is that it is ever changing and that requires our teachers, pupil and our school system to be adaptable, flexible and alike to LEARN HOW TO LEARN. As Educators and School Leaders our core responsibility is to provide an environment that engages our students in learning. Such environment does not result simply from putting in place particular physical features, rather it is the result of a culture for learning and as such a culture is the result of everything we do, think and believe. At AMS. P. Obul Reddy Public School, children learnt the importance of integration of cultures and values through daily activities which were so designed as to foster respect for diverse ethnicities and religious faiths through the INTERNATIONAL SCHOOL AWARDS program (ISA) which got embedded in the curriculum. If Education of the 21st Century is to contribute to improved learning, better outcomes and Internationalism for making our children Global Citizens, then our pedagogy must be designed for the fundamental process that should be used to target resources, benchmark learning against world’s best teaching practices and monitor these trends over time. Etched on the stone of Martin Luther King Jr. Memorial in Washington, USA , are words which dramatically sum up the challenges of the 21st Century. “If we have to have peace on earth, our loyalties must become ecumenical rather than sectional. Our loyalties must transcend our race, our class and our nation. And this means we must develop a world perspective”. When the posture of our School is towards inculcating Internationalism in our Teachers and pupils we will surely begin to develop global citizens in the future.